Take a break and Gangnam Style! Yes, hello! Sorry for the week's-worth blog hiatus due to school work and other fashizzles which I may use as an excuse. Needless to say, last week was really heavy for me: FS Paper submission + Case Analysis + Oral Exam and such. Since I don't want to spend my entire week without any blog post updated, I took my camera, tripod, remote, and car keys out for a quick shoot! 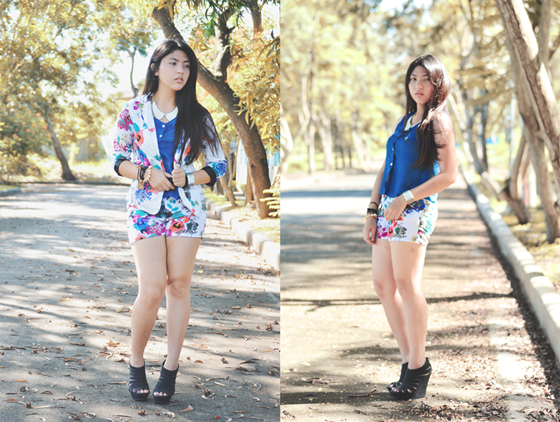 I bought both floral blazer and floral shorts from a local online shop named The Savvy Shoppe, you can also shop personally at their stall located in XU SEP mall. 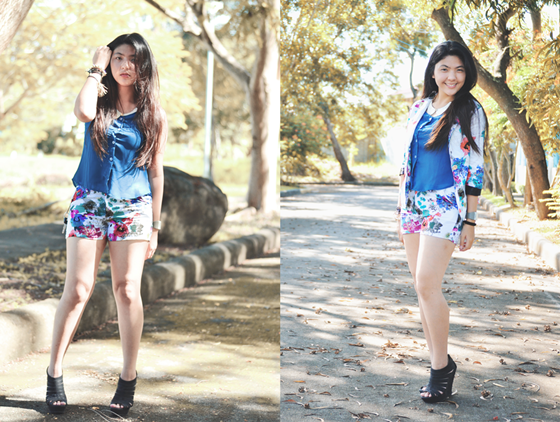 Make sure to drop by sometime, they offer tons of cute clothes in a very reasonable price! 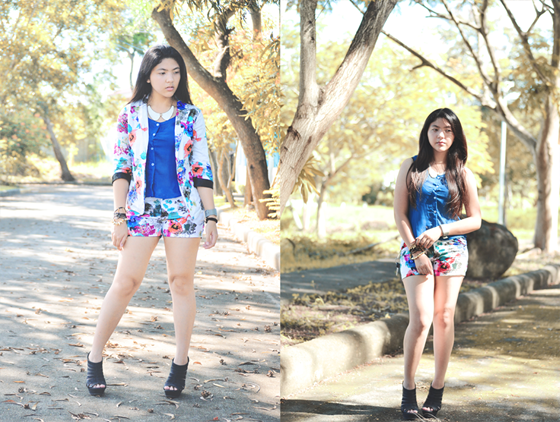 I didn't go to my usual outfit-post-place (again) because I had a quick photoshoot with my sister for her upcoming prom! 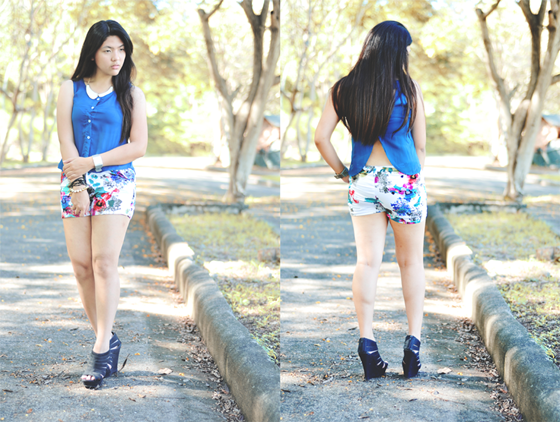 I'll be uploading the photos in this blog soon! 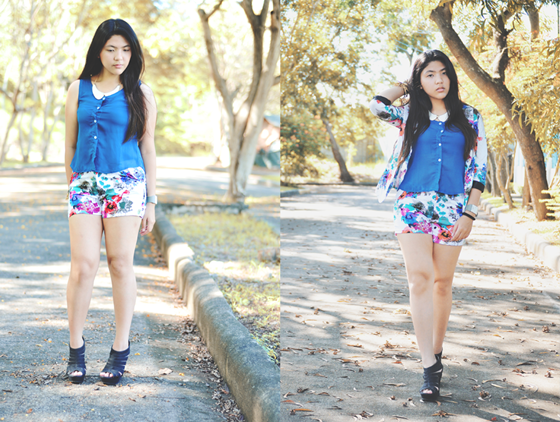 Since it's too sunny at my usual place, we had to find another spot for her pre-prom shoot and my outfit post. Things turned out pretty well! I might be coming to this new place more often especially when it'll be scorching hot outside. 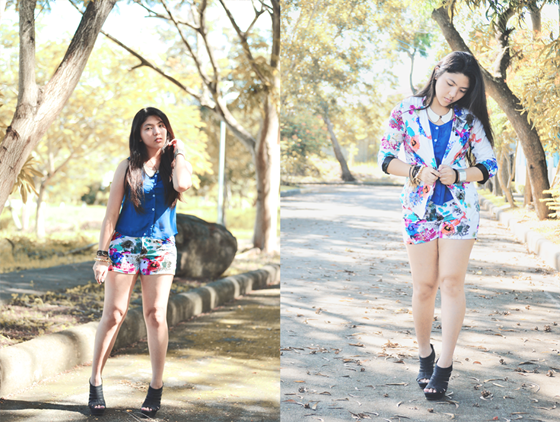 Floral blazer and shorts from The Savvy Shoppe | Blue Shear Top from Hang Ten | Strappy Wedge from Rusty Lopez | Watch from Wize and Ope | Collar Necklace and random bracelets from A Thrift Shop, CDO, Philippines. NOTE: My FS Group's defense is fast approaching! Also, I will be acting as a main character in our ENG41 Play soon. Gosh, spell HECTIC.